#OhYesIDid. #GrabASpoon. #BottomsUp. #YouWon'tBeSorry. #LuckOfTheIrish. #Swoon. *You can also use a vanilla bean pod with the seeds scraped out or pure vanilla extract. If using extract, add an extra teaspoon to both recipes. In a medium saucepan over medium-low heat, melt butter and brown sugar together until smooth and incorporated. Remove from heat and add heavy cream, taking care as it will bubble up. Add salt and vanilla paste. Allow to cool for several minutes. In a separate bowl, whisk egg yolks. VERY slowly, add a few tablespoons of custard to eggs, whisking after each addition. If you add the custard too quickly, you'll end up with scrambled eggs. Not good. Once the eggs have been tempered, slowly add the egg mixture back to the saucepan and place over medium-low heat for several minutes until it thickens. Add pale ale. Custard mixture will be a bit frothy. Once texture is achieved (the back of a spoon will coat nicely), pour custard into a sieve that's been placed over a large bowl or measuring cup with a spout. Pour custard into cups or ramekins halfway. Place in fridge for about two hours or until set. Once pale ale custard is set, make chocolate stout custard. In a medium saucepan, bring heavy cream to a simmering boil. Remove from heat and add in chocolate, sugar, and salt; whisking until fully incorporated. Add in vanilla paste; whisk in Stout. Again, it will be frothy. In a separate bowl, whisk eggs and temper. Continue to follow remaining steps as indicated above in pale ale custard. Once chocolate custard is ready, allow to cool for several minutes. Very slowly pour chocolate over top until you reach the lip of the dish. Place in fridge for several hours or overnight for best results. Once ready to serve, dollop with whipped cream and a dusting of cocoa powder. Can you send me some by mail.... Yummy ! dude....so boozy. Like...probs the only way I could get drunk would be by eating these (I dislike drinking but I looooove eating!) :P and I could. NOT. resist these! Saw you on Buns in my Oven. These look and sound awesome! Pinned and shared. These are lovely! 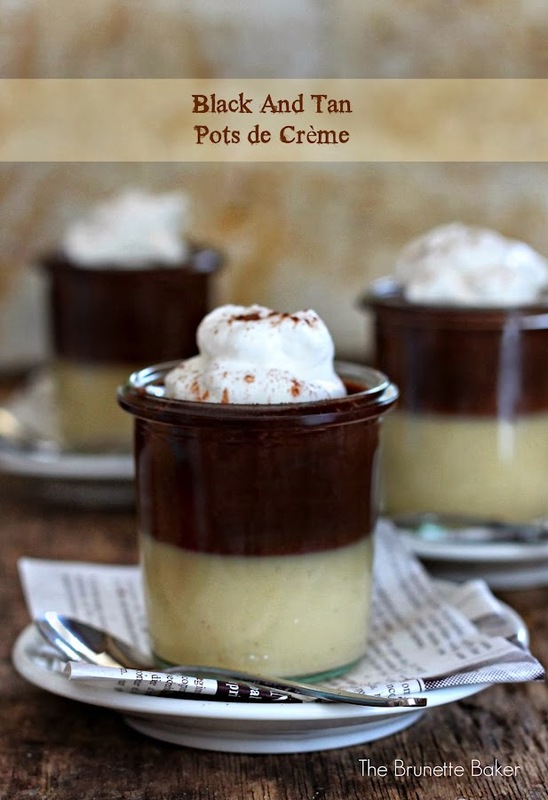 I adore desserts that are boozy + classy! Well that just sounds amazing! Oh my goodness, what a delicious looking dessert and great combination!! Oooo! That's all I have to say.